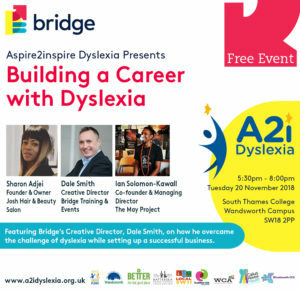 Aspire2inspire Dyslexia CIC is a charitable organisation based in Wandsworth, bringing awareness of Dyslexia within the community and encouraging entrepreneurship amongst dyslexics. A2i supports dyslexic adults who want to return to education, apprenticeships, self-employment and also offers employability skills. On Tuesday 20th November, Dale Smith, Bridge’s Creative Director, will join as three successful dyslexic entrepreneurs showcase their businesses, sharing their experience in setting up their enterprises despite the challenges they may have encountered as dyslexics.